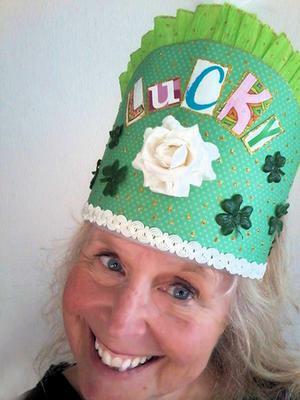 This lucky St. Patrick's Day crown is a festive decoration for shamrock day. Here's how to make one! 1. I rip up magazines for cool fonts and cut them to size. 2. Find your “lucky” letters and set them aside. 3. Cut two pieces of scrapbook paper in an arch shape. Then cut the top two inches of one of the arch shapes and put the bottom part in your scrap pile. 4. On the back side of the arch shaped piece, put double stick tape covering the top edge. 5. Then pleat crepe paper sticking it to the double stick tape so most of the crepe paper shows on the other side. 6. Next, use the 2 inch piece of arched paper to cover the bottom edge of the crepe paper securing it with hot glue. 7. Now you can loosely fold the paper in half to discover the middle and line up the middle of the headband. 8. I put a dab of hot glue where the center of the headband is quickly attaching the center of the paper. 9. After that is set, it is easy to wrap the paper around the headband. It works best to put the hot glue on the paper rather than the headband (the glue sets faster on the headband so you have more time when the hot glue is on the paper). Make sure the paper is flush with the bottom of the headband as much is possible. 10. The best part is decorating the front. I used stuff I already had. You can use silk flowers, images from magazines, rick rack trims, ribbons, feathers, small toys and junk jewelry. 11. The finishing touch is decorating the edges with glitter glue. So cute! I love how you used magazine letters in all different size fonts to spell the word LUCKY. Thank you for sharing this - I'm sure visitors will enjoy this project. Happy St. Patrick's Day!